Leh Keen is a successful road racer who has driven many great racing machines. Recently, he has been racing Ferraris and before that he drove the legendary Brumos Porsche 911. It should then be no surprise that he would be interested in something like a Rauh Welt Porsche. However, his father (McGrath Keen) was the first one to bring up the idea of owning a 911 Rauh Welt. The 993 based tuned Porsche has a very unique look and is a race car for the street. It is fitting then that a racing family would add one of these stunning creations to their garage. This video from eGarage shows Leh and McGrath Keen talking about how they came to purchase the 993 Rauh Welt Porsche. 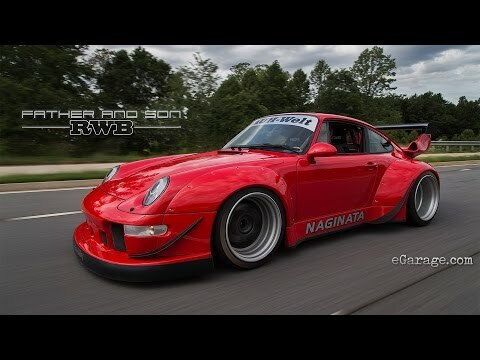 It also shows footage of the build by Nakai of RWB. Watch the video below and then let us know what you think of the car in the comments. Earlier this year a video of racing driver Leh Keen driving a Porsche 911 GT3 R at the 24 Hours of Nurburgring was released. The video was called “Rain Dance” and showed Mr. Keen driving in some very wet conditions during the race. All of the footage was seen from his point of view. Now a longer version of the video has been released. This time it features more behind the scenes footage from before the race include practice laps. Once again the entire video is shown from Leh’s view point and it features even more footage of him driving the 911 in wet conditions. Check out the video and then let us know what you think of it in the comments. Leh Keen is a endurance racing driver that is probably best know for his success in the Brumos Racing Porsche (although he has had other racing success driving cars such as Ferraris). Earlier this week Drive released a video of Leh driving his Porsche 911 GT3 R in the rain at the 24 Hours of Nurburgring. That video has gotten a lot of attention for the talented racer. This video is an interview with Keen and talks about his racing experience as well as the “Rain Dance” video. In watching the video you get a lot of insight on what it takes to be a professional racing driver. You also learn more about Leh and get a feel for his personality when not driving. This last weekend was the running of the 24 Hours of the Nurburgring and the rainy conditions made it difficult for the drivers. One of the drivers was Leh Keen. He was behind the wheel of a Porsche 911 R for the famed 24 hour race on one of the world’s most famous tracks. The conditions were so bad that their was a 9 hour red flag stop to the race. This video captures Leh driving the 911 race car around the track in some pretty slick conditions. This footage was taken just before the red flag came out. The video shows all the skill that is required in this tough race and how dealing with driving in the dark while it is raining can be very difficult for a driver. There is no music or talking in the video, just the sound of that wonderful flat-six engine. If you are a racing fan or a Porsche enthusiast (or both), you’ll definitely want to check out this footage.